As we hit week 4 of the college football season, it’s time for more game picks with 5 matchups to pick. We’ll feature games from 4 of the 5 power conferences with a lot at stake for the teams involved. So let’s get to the picks. For the first time ever, Jimbo Fisher and Nick Saban will lock horns as the Texas A&M Aggies travel to Bryant Denny Stadium to face the Alabama Crimson Tide. The Aggies nearly pulled a massive upset against Clemson two weeks ago in College Station but being on the road, they’re really up against it this week. Kellen Mond and company will have to keep the ball away from Tua Tagovailoa and the Tide’s high powered attack. Unfortunately, this matchup won’t yield a classic like it has before, as the Tide roll on. Our second game is one of the more intriguing ones of the weekend as a pair of one-loss conference rivals face off as TCU travels to Darryl K Royal Stadium to face Texas. The Horned Frogs gave Ohio State all they could handle at Jerry World last week, but in the end didn’t have enough. Meanwhile, the Longhorns are coming off an impressive win over the USC Trojans at home where quarterback Sam Elhinger played one of his better games. This could be a major turning point game for Tom Herman’s bunch and I will take them to get it done for the second week in a row. I like the Long Horns to win a close one for their third straight W.
The third game of our picks features another pair of Big 12 teams as the Kansas State Wildcats travel to Mountaineer country to face West Virginia. My pick for the Heisman trophy, Will Grier, is off to a terrific start with 9 touchdowns on the season and he should only pad those numbers this week at home. I like West Virginia in a route in Morgantown which keeps them on pace with Oklahoma in the conference. We now move from the Big 12 to the Big 10 as the Wisconsin Badgers travel to Iowa City and face the Iowa Hawkeyes. The Badgers are coming off a disappointing loss at home to BYU while Iowa is 3-0 so far this year and looking for a statement win in conference. While the Badgers have Jonathon Taylor and Alex Hornibook I don’t like their chances. This is a really tough road test for them against a very steady Hawkeye team led by signal caller Nate Stanley. This Iowa team has the chance to go far this year and I think this win will propel for the next several weeks. 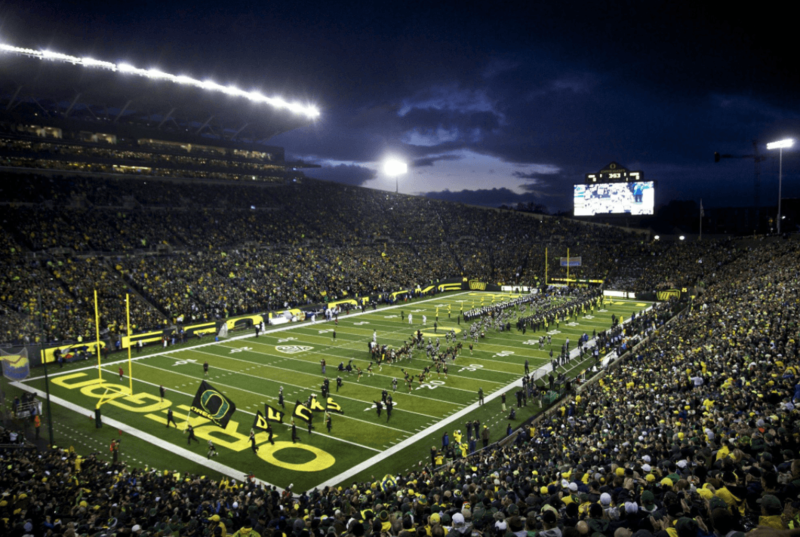 Our final game takes us to the site of College Gameday this week as Oregon hosts Stanford at Autzen Stadium. This game has huge ramifications on the Pac 12 standings and the winner will have the chance to challenge Washington later this year. Stanford hasn’t seem to hit their stride yet as Bryce Love is playing banged up, but they are undefeated so far. To win this game though they’ll need their offense to pick it up because Oregon can light the scoreboard up. Justin Herbert leads the Ducks offense at quarterback and he can absolutely sling it, with 12 touchdowns and 840 yards passing through 3 games. The Autzen Zoo hasn’t had a game that feels this big in a while and head coach Mario Cristobal will have this group ready to go. So in the words of Lee Corso, GIVE ME THAT DUCK! Uploaded by Dan Lyons on 2015-09-12. Flaherty’s Fighting Irish Recap: Book It!